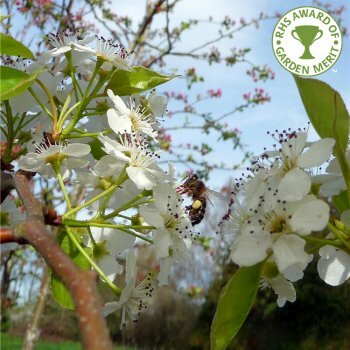 A fantastic small tree, Pyrus calleryana 'Chanticleer' has glossy, dark-green foliage that creates a wonderful foil for the mass of white flowers in April-May. The flowers are popular with wildlife such as bees. 'Chanticleer' is one of the best ornamental pears for autumn colour, with the foliage turning vivid red before falling. Pyrus 'Chanticleer' is a conical, flame shaped small ornamental pear tree that will grow to just 5 x 3 metres in 20 years. Worthy of being a feature tree, it is also perfect for avenue planting due to its slender form or for small urban gardens as it is also tolerant of pollution. Any moist, but well-drained soil will suit and where full sun is given, some exposure will be tolerated. The word 'Chanticleer' is french for 'sing clear' and was given this name by the Scanlon Nursery after it was discovered in Ohio. Our pot grown upright ornamental pear trees can be planted at any time of the year. Start by removing weeds and grass within a metre of your desired planting hole. Dig a square hole as deep as your root mass and approximately 2x as wide. To help the tree establish more effectively, sprinkle root grow in the hole. Remove the pot, gently loosen the roots and place into the planting hole. Mix 50% of the original soil with 50% compost, fill in the hole and firm around gently. Avoid banking the soil up around the collar of the tree. We recommend planting ornamental pear trees with a stake and tie to ensure the roots are well anchored - instructions are in the online planting guide. If you’re planting 'Chanticleer' in spring or summer, water well for the first few months. Increase watering if there are extended periods of hot or dry weather. If planting in autumn, you may only need to water a little. Upright ornamental pear trees should be pruned during the dormant season, from autumn to early spring. Pruning requirements are minimal, focussing on only damaged or awkwardly placed branches. When pruning an ornamental pear tree you should aim for a balanced all round effect. For the first several years, prune the lower branches to maintain a clear stem. Even weeping varieties need to have a clear stem to allow room for their pendulous branches.